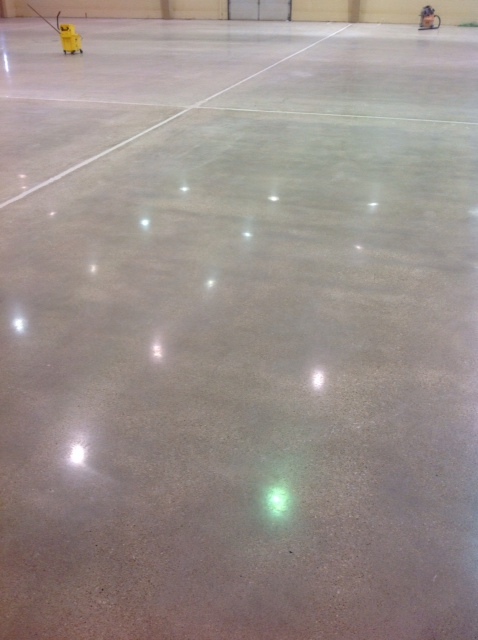 There is something to be said about a concrete floor that is enlivened and totally transformed with a natural grinding and polishing process. 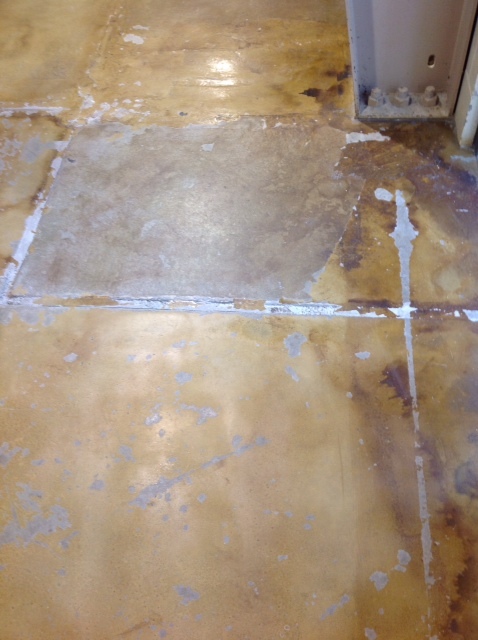 It is obvious after little time when a floor is done poorly, but properly polished concrete that is maintained will exhibit a long-lasting sheen. 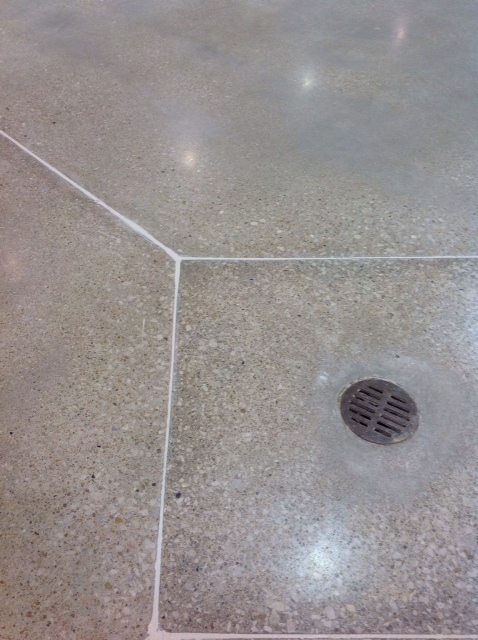 Hunter Advanced Concrete Polishing embodies this concept and is to be admired for the highlighted project below. For years, Hunter Advanced Concrete Polishing has been a preferred provider of some of the region’s leading retailers, restaurateurs, contractors, schools, municipalities, commercial and industrial, and others who understand the value of their property – and the importance of preserving it. What began as a small family business has become an enterprise with more than 20 employees. Together they continue to apply the very best techniques and learn-by-doing to ensure that every job is done right. From the materials used, to the equipment and techniques used to apply them, Hunter ensures high quality craftsmanship in the production of polished concrete floors that instantly become a mark of pride for their customers. 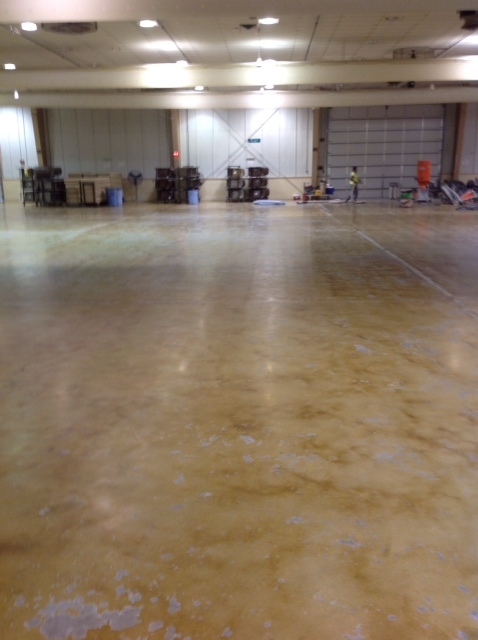 Hunter ACP was tasked with transforming the above main arena floor at Christensen Field in Fremont, NE. It was in fairly rough shape before, as evidenced in the top left picture, due to a poorly executed resurfacing job by a different contractor two years prior to Hunter getting their hands on it. The Hunter ACP crew first ground down the surface with a Husqvarna grinder and rugged diamond tooling. 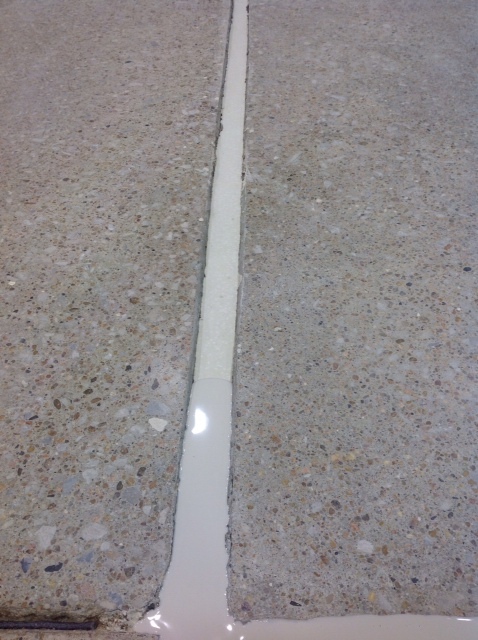 Then the crew filled in the 2″ wide joints with joint filler from Metzger/McGuire. And the final step in the process was polishing the entire surface to the desired shine by working up to a higher grit with each pass. Hunter ACP is a large proponent of a natural, long-lasting result achieved from truly polishing a surface, not simply applying a protectant and then burnishing, which will wear and dull more quickly over time. 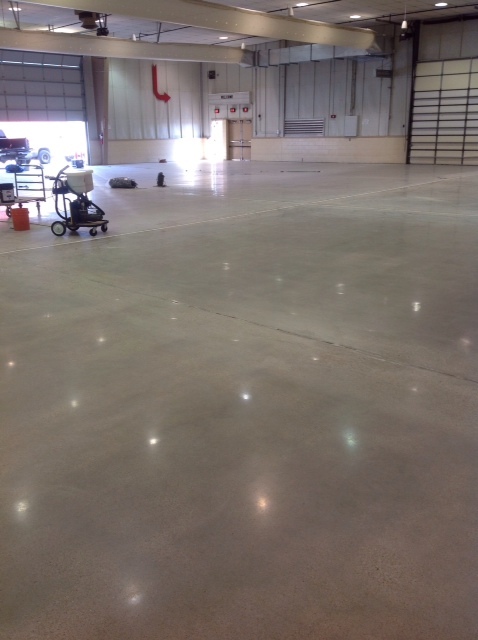 Thus, the truly polished floors at Christensen Field should last for years to come, especially when maintained to Hunter ACP’s prescribed specifications. Hunter ACP guarantees that the floor will not spall or lose its luster as long as the maintenance program is followed, which is something to consider. A maintenance program is vital for the upkeep and lasting effect of a concrete surface, especially when heavy foot traffic is a factor.